Third times a charm is a common phrase we all seem to be familiar with. At Knife Informer we’ve previously reviewed the Rike Knife Thor 2 Integral (one piece handle) flipper, and really enjoyed it. It was with bated breath and a lot of patience that we waited for Rike to produce the 3rd in a line of high-end production knives dubbed by the ‘Thor’ name. The Rike Knife Thor 3 folding knife is indeed an integral like the other two model variants before it, however this time Rike heavily cuts out and mills the titanium handles for both a design aesthetic, and weight purposes. 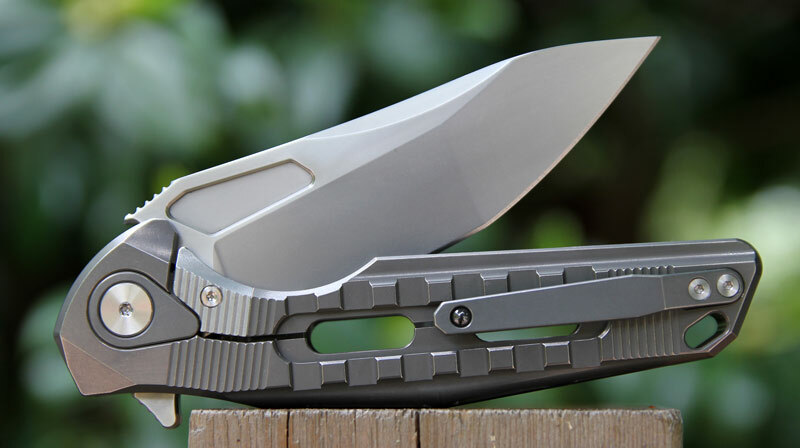 Appearing similar in profile, but otherwise with an incredible industrial and modern take on the Thor design, this Rike Thor 3 is uniquely individual, and at first glance seems to be one hell of a production integral folder. Rike Knife Co. has successfully managed to grab hold of the American folding knife market over the last few years. What appeared as a new company from China only a couple of years ago, has turned legit. Rike is now a relatively well known and established company that U.S. buyers are getting increasingly comfortable with. The combination of great design, product execution, fit/finish, and reliability seem to have propelled Rike knife Co. very effectively (just as we suspected they would). The Thor line for Rike represents one of the premium models that they offer, and is available as a limited-edition numbered release. The Thor 1 was an integral folder that pushed the boundary of what production knives are capable of producing. This was only about 2 years ago. Fast forward about 1 year from that point, and the Thor 2 emerged. Again amazingly well produced like the Thor 1 ,model that came before it, but with perhaps a bit more EDC appeal and usability.